Julie Porksen and Sir Alan Beith MP. The Lib Dem candidate in the Berwick constituency is one of 15 in her party to receive a donation from Lord Oakeshott, who is spending £600,000 to build a ‘progressive alliance’ to beat the Tories. The city financier, who was forced to resign after commissioning polls suggesting the party would do better without Nick Clegg as leader, is giving £300,000 to 15 Lib Dem candidates, including £20,000 for Julie Pörksen, who is bidding to become Sir Alan Beith’s successor as MP for Berwick. 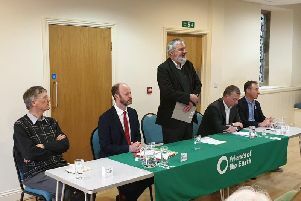 In an unusual move, he is also supporting 30 Labour candidates with another £300,000 as well as giving £10,000 to the Green Party’s Caroline Lucas, in an attempt to ensure a Labour-led Government with Ed Miliband as Prime Minister after May’s General Election. Explaining his motives, Lord Oakeshott said: “Britain stands on the edge of a cliff with the General Election only 105 days away. Will we vote Tory or Ukip for Euro referendum chaos, lasting two years at least and putting thousands of businesses, millions of jobs and our long-term peace and security at risk? Or will Labour, Liberal Democrat, Green and all progressive voters come together in the marginal seats that matter to elect a parliament for progress and reform and a Labour-led Government with Ed Miliband as Prime Minister?